Fort Collins Windows & Doors specializes in French door installation, providing services to help bring these beautiful and functional doors to your home or business! As with everything we do, it all begins and ends with great customer service. We don’t just want to be the best door replacement company; we want our customers to be so impressed by the first phone call to the cleanup and beyond that they will want to refer us to their neighbors, family and friends. This kind of referral business only comes from those we have impressed, not just with our affordable French door installation, with our commitment to customer care as a whole! A French door installed by our expert team will bring some advantages to your home or business. Elegance: A French door for an entryway, interior room or another area adds a taste of elegance and a feeling of spaciousness that other doors don’t offer. Accessibility: A French door install can provide more space and ease of access to the mobility impaired, such as those in a wheelchair or scooter. As those who struggle with doorways due to mobility impairment can tell you, a professionally installed French door is a breath of relief when entering a doorway at a home or business. Moving Things from Room to Room: When it comes to furniture, nothing will throw your back out faster than wrestling a reclining sofa (which weigh an average of 200lbs!) through a few doorways. Having our experts perform a French door installation will make the process of moving furniture or other large items through your doorways super easy! 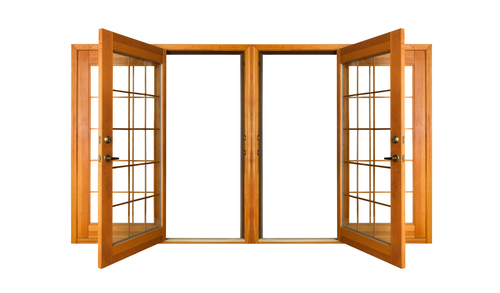 Why choose Fort Collins Windows & Doors for your French door installation? We are awesome (if we do say so ourselves)! No, French doors, in particular, require a professional amount of precision to function as they are designed to do. It goes into really complicated things like geometry and millimeters of space between the doors (which is why you should NOT try it at home!) to be as efficient and trouble free as possible. Our French door installation experts have years of experience in this specialty and have a system in place that makes this service fast and, therefore, affordable. Our desire is to give you the best experience possible when working with a door installation contractor, something we as a company are very passionate about! Our jobs are scheduled around our client’s busy schedule (not ours) to make everything we do as convenient for you as we can make it! Contact us today at 970-372-5120 to take the first step to having a French door installed in your home or office!